The United Kingdom is a small country in northwest Europe. You can travel the length of the UK mainland, from Land’s End in southwest Cornwall to John O’Groats in the north east of Scotland, in under 24 hours. Despite its small size, the UK is one of the most influential countries in the world, a nuclear power, and a permanent member of the United Nations Security Council. The UK is the successor to the British Empire, the largest empire in world history, which existed from the 19th to the early 20th century. Capital: London (population: 8.67 million). Administrative structure: four countries (England, Scotland, Wales, and Northern Ireland) divided into numerous counties. Demographics: 83.6% English, 8.5% Scottish, 4.9% Welsh, 2.9% Irish, along with minority Indian, Pakistani, and Chinese populations and people from African nations (0.7%). Official language: English. Other regional languages include Scottish Gaelic, Welsh, Irish (Gaelic), and Scots. 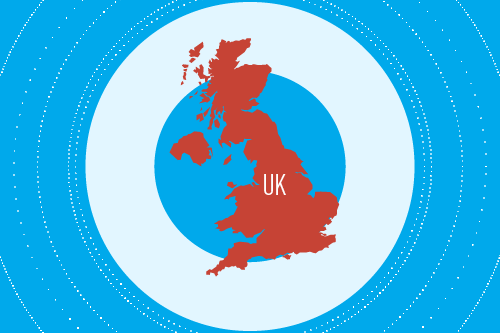 The UK has a highly developed games market. It is number two in the world by popularity of games consoles: 71% of all gamers play on consoles. According to research conducted by TIGA and ARM, around 70% of UK developers work on projects for mobile platforms. 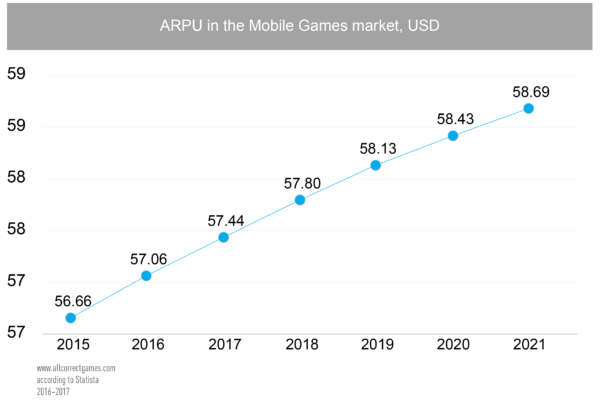 Mobile app analytics platform App Annie conducted research into the use of apps in 2015. The most popular mobile games in the UK included arcade and casual games such as Candy Crush Saga and Clash of Clans, and card games like Solitaire. 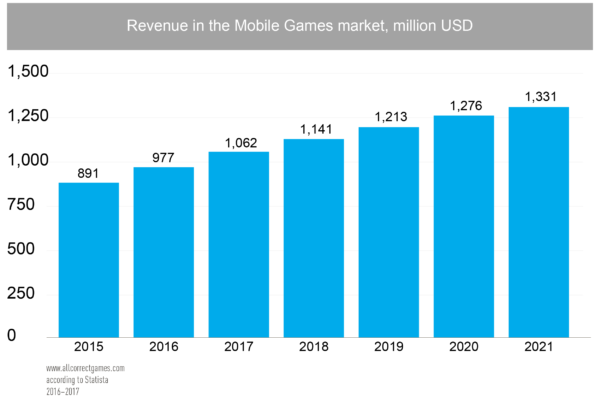 The UK mobile games market is growing at breakneck speed. 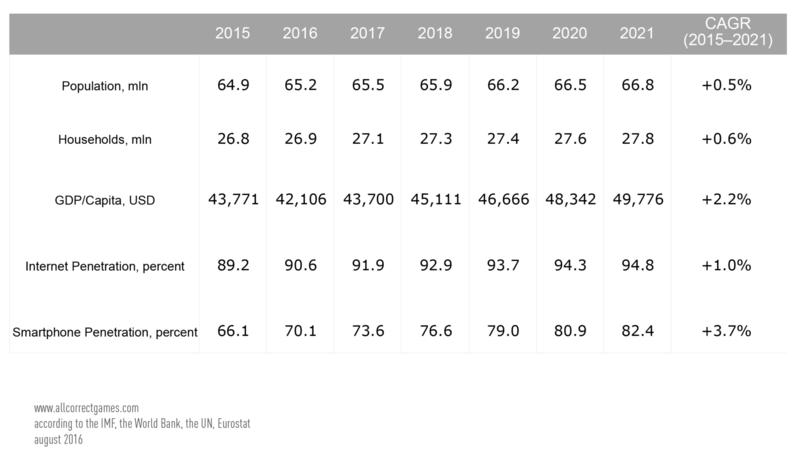 Figures from IAB UK show that in the first half of 2016, the market grew at a rate of 56.1%. 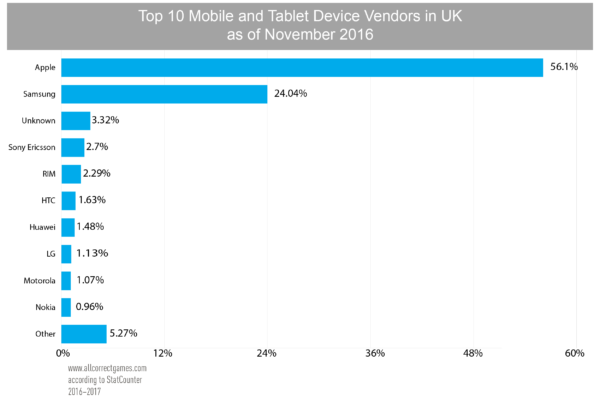 For the first time in British advertising history, ad spending for mobile devices exceeded ad spending for PCs and tablets, totaling £802 million. The top video-streaming app by number of users in the US and UK in 2016 was YouTube, although Netflix surpassed it in terms of revenue. In the summer of 2011, BlackBerry Messenger (BBM) emerged as a powerful mobilizing and coordinating tool for those involved in the London riots. This service from the Canadian company is praised for its protection against surveillance and allows messages to be sent instantly to large groups of users. 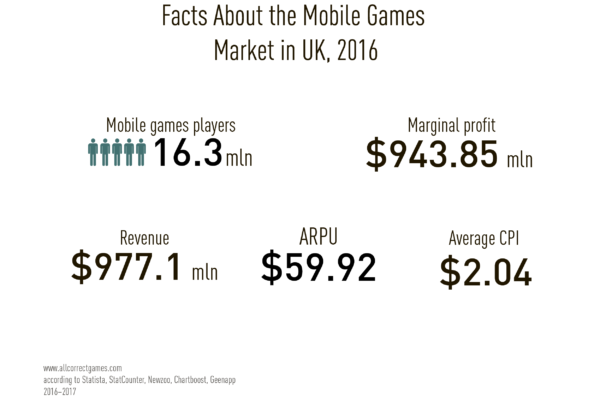 Who plays mobile games in the UK? 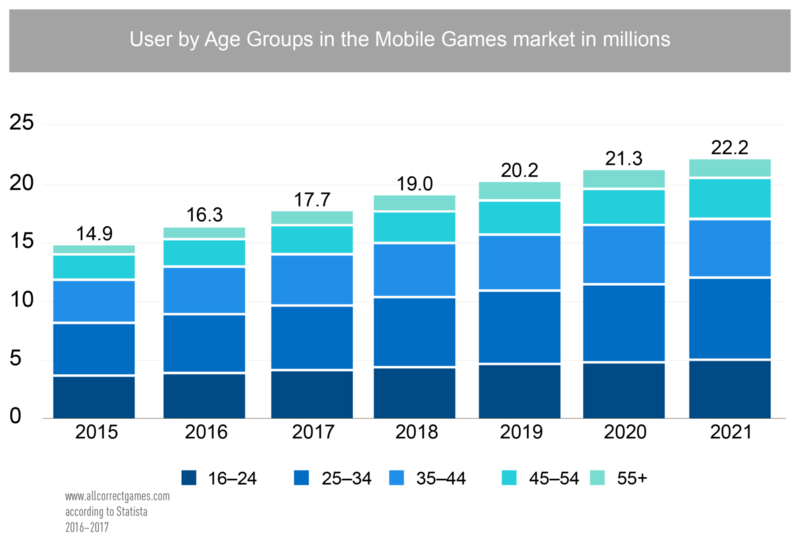 In Europe and the US, computer games are played by people of all ages. Gamers under 18 make up only 20-25% of the total. The UK stands out for its large share of gamers in the 26-30 age bracket (20%). 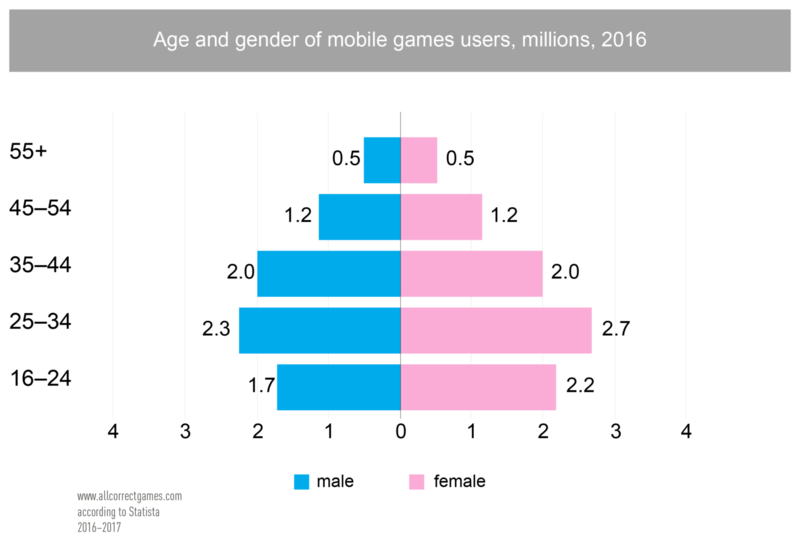 Computer games are popular among members of both genders: women play games as much as men. 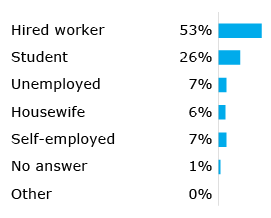 In 2015, Mail.Ru Group carried out research into the occupations of gamers in Europe and the US. An excerpt from the results is given below. In the UK, gamers more often play shooters, sports simulators, popular racing games, and action titles. According to the results of the previously mentioned research, most payments were made in order to unlock additional content. The least popular reason for payments was visual customization of gameplay. The UK also has the largest share of people willing to pay for extra features. 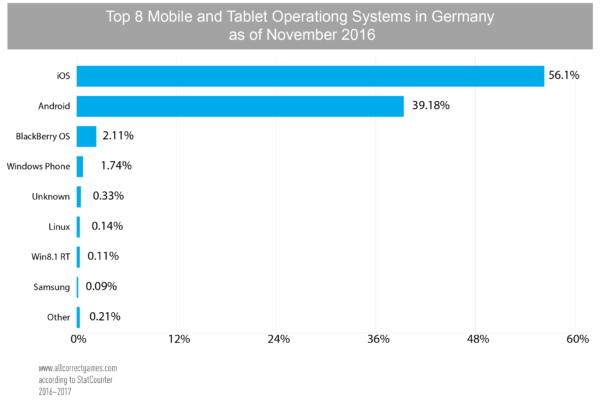 Almost one in three English and German players are willing to pay solely for game access. One of the best-known mobile games developers in the UK was King, but it has moved its headquarters to Sweden and, moreover, has been bought by the American company Activision Blizzard. Based on these factors, we have chosen not to include King in our list of British games developers. The UK games industry comprises 1902 studios and may be worth as much as $2.8 billion, which is double the 2012 figure according to official estimates—Ukie wrote about this in their report in 2014. Jagex is the creator of the most popular free MMORPG in the world, as recognized by Guinness World Records. Released in 2011, RuneScape invites players to explore a virtual world while leveling up their characters (this is done by paying money). Jagex has also released an online card game and a shooter on Steam, both based on RuneScape. Jagex is located in Cambridge, and more than 400 people work across its two studios. Known for: Warhammer 40,000: Deathwatch, Hunters, Hunters 2. RodeoGames is a small, tight-knit team of four games professionals who decided to quit working for major studios and turn their hand to developing games for smartphones. The company collaborates with Games Workshop on the Warhammer mobile games, producing digital versions of the popular tabletop game. Known for: Broken Sword, Beneath a Steel Sky. Revolution Software was founded in the 1990s. It developed the popular Broken Sword series in which players did not so much control the characters as revel in the convoluted plot. A quirky mixture of puzzles, music, and hand-drawn graphics made the series a bona-fide hit. Revolution Software has stated that it sold around four million copies of the Broken Sword games, earning the company more than €100 million. It continues to release new Broken Sword titles and is also adapting the games for consoles and smartphones. London-based company ustwo developed Monument Valley, a puzzle game for iPhone and iPad that won an Apple Design Award in 2014. The game was even played by Frank Underwood, the main character on the TV show “House of Cards.” In addition to its blockbuster puzzle game, ustwo develops apps and software for other companies, such as a facial recognition program for Google Android Wear and software for Tesco’s Hudl tablets. Known for: Worms, Alien Breed. Team17 is the creator of the Worms franchise. The company began in 1987 by developing software for Amiga computers and only turned to video game development in the 1990s. Worms was released in 1995 as a simple war game in which the player controls teams of animated worms. Despite its simplicity, the game was a surprise hit, outselling juggernauts such as Tomb Raider and FIFA 96. Since then, Team17 have released many Worms games and show no signs of stopping. TIGA trade association and ARM conducted a joint survey of developers to find out which platforms they develop for. The results were as follows: 73% of those surveyed develop games for the iPad, 72% develop games for the iPhone, and 63% develop games for Android. There were few developers willing to work on projects for consoles: only 18% of those surveyed develop games for Xbox and PS3. The next-gen console war is at its height: the Xbox One is only slightly more popular than the PS4. 17% of respondents are working on games for the Xbox One, while 15% of respondents are developing games for Sony’s new console. In addition, 52% said that they wanted to develop a game for the Xbox One in the future, while 48% said the same for the PS4. It is essential to distinguish between British and American English. While there are many similarities between them, there are a host of differences, with the most important being the comparative simplicity of American English. Conclusion: English is either a game’s main language or the first language it should be localized into. It opens up access not only to the UK and other English-speaking countries, but also to a significant portion of the western world. Players may prefer to play a game in their native language, but if the game is good, they will play it in English. Moreover, translation between rare languages is traditionally done via English. It may be worthwhile considering separate British and American English versions, especially if the character responses are voiced.